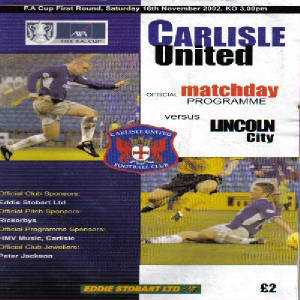 Yes, I was there that night, along with the other 40 Lincoln fans. This game had to be re-arranged from a few weeks ago and even up until kick off, no-one was sure if the game would still go ahead. Infact, getting into Carlisle on the near empty coach, some of their fans were waving their hands in a motion that would indicate that the game had been cancelled. The weather had been horrific all day, snowing and only a vast amount of work from Carlisle officials and supporters made this game possible. I wonder if they thought the 4-1 win for Lincoln was worth the effort. Brunton Park is near enough on the outskirts of Carlisle so getting to the ground is quite easy and the car park/abandoned field behind the disused stand is incredibly useful. The turnstile system is a bit awkward at times at Carlisle sometimes make you buy the tickets before hand and that often lead to "interesting" conversations between fans who didn't know this and the local turnstile operators. The main home stand is actually quite good and as impressive as any other stand within the lower leagues, the unusual thing about this is the fact that around 1/4 of the stand goes beyond the pitch. This is one of 2 possible away ends, if you are in this stand, your seats run as far down the pitch as the 18 yard area, however, the view from this stand is excellent. 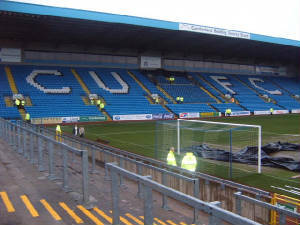 The other possible away end is a terraced section behind a goal and although it offers a relatively good view for a "portrait" view, it is definatly inferior to the view from the other possible away end. 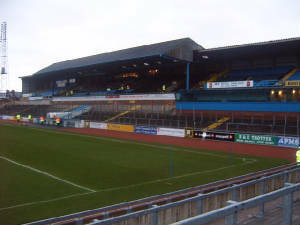 The stand behind the other goal is a large terrace with a roof this time and an unusual "zig-zag" style roof. 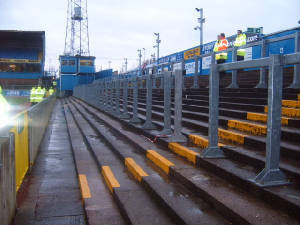 The final stand is a terrace section which is below several different sections of seating. The atmosphere at Brunton Park is fairly overrated and although there are often a bunch of about 10 of them singing the same ironic song whenever they do pep up. It's only when they've scored that the fans start signing. Their range of chants is also pretty limited and you could count all their chants on one hand and still be wasting 2 fingers. I used to actually respect Carlisle fans but in the 2003/4 game, their "fans" started chanting "You're supposed to be deceased" towards Keith Alexander, who had brain surgery just a few months earlier after collapsing in his house. 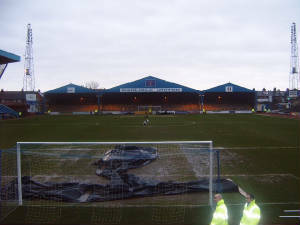 Overall, a trip to Brunton Park really depends on your mood, if you're on a real downer about something, the last place you really want to be is Carlisle (trust me, I should know) but if you're really in a mood for a being abused by pure idiots of football fans, than Brunton Park is your place.